Every year, 480,000 Americans get killed because of cigarette smoking and more than 41,000 of them from exposure to secondhand smoke. Smoking related illnesses, also because of non smoke-free workplaces cost $170 billion a year for direct medical care and $156 billion in lost productivity. Quitting isn’t a one-day project, it is a process! Along the way you shouldn’t be afraid to ask your friends and family for support. Check out the American Cancer Society for additional information and tips. Another essential aspect is the work environment, where we spend a lot of our time in. It needs to be supportive and free of temptations to ensure the success in quitting smoking. 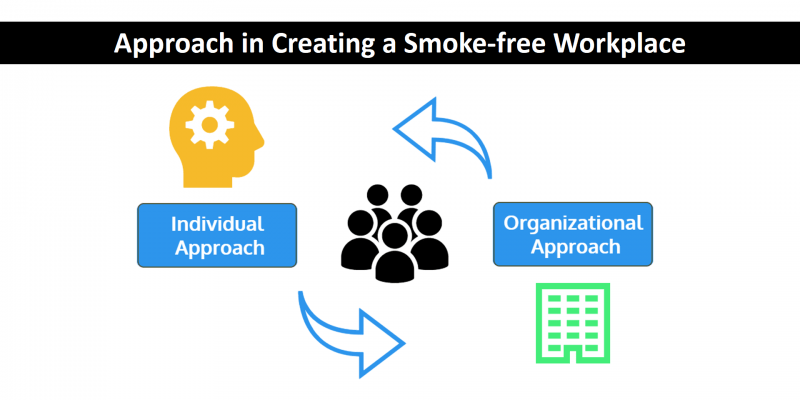 Continue reading to find out some ideas on how to generate a smoke-free workplace. Uniform communications on company platform, intranet, newsletters, email campaign, etc. Create a company culture of awareness by posting educational messages in visible areas such as info board, washrooms, elevators, etc. Communications to educate and promote self-awareness of employees (read more on self-awareness serie from one of our Health Coaches) i.e. through targeted campaigns, learning series, etc. (1) Centers for Disease Control and Prevention. Burden of Tobacco Use in the United States. https://​www.cdc.gov​/​tobacco/​data_​statistics/​fact_​sheets/​fast_​facts/​index.htm. (2) American Cancer Society. Quit Tobacco 2017. http://​contentsubscription.cancer.org​/​quit-tobacco.html.